The 1952 American film Singin’ In The Rain has become one of Hollywood’s back catalogue classics and is often considered to be one of the best movie musicals of all time. It is no surprise that the screenplay has been adapted for the stage on countless occasions. Having been a sell out success at Chichester Festival Theatre, director Jonathan Church’s most recent production transferred to London’s West End in 2012. 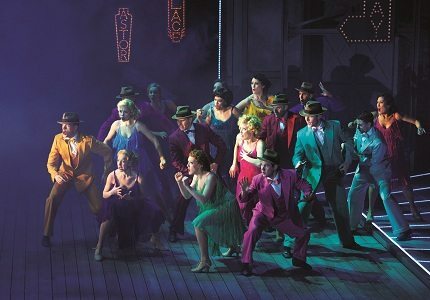 Singin’ In The Rain has received critical praise and been nominated for prestigious theatre awards however, like the original film, has yet to receive a prize. The show is set in America’s roaring 20’s, just as talking pictures were introduced to the movies. On screen silent film star couple, Lina Lamont and Don Lockwood, should be thrilled for their transformation into all talking and singing screen sensations! However there is one major problem, the leading lady has a hideous voice! Enter chorus girl Kathy Selden to save the day! Don desperately tries to convince the stubborn beauty to dub her voice in for the lovely Lina. After spending an increasing amount of time together, Don and Kathy put aside their differences and begin to fall for one another, leading to the famed rain scene. 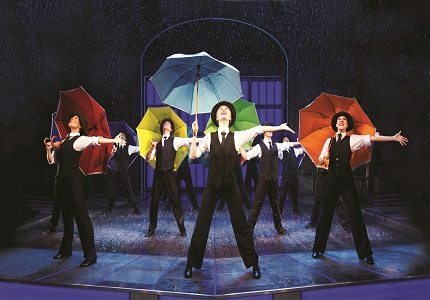 The show not only has a punchy storyline, but also contains a great deal for high energy show numbers, “ Make ‘Em Laugh” “Good Morning” and the all time favourite “Singin’ In The Rain” coupled with some excellent choreography. 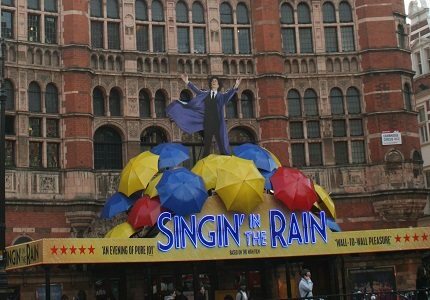 A big draw to the current London revival is the novelty factor of the onstage rain and at the Palace Theatre, it doesn’t simply drizzle but it pours! Audience members in the front few rows of the Stalls will find themselves in the ‘Splash Zone.’ If these are your seats then remember to bring a plastic rain mac! Children will love Singin’ In the Rain and be especially enchanted by the onstage rain. Please note that children under the age of 5 will not be admitted into the Palace Theatre.